ATA Cases – Custom Case Company, Inc.
ATA cases provide protection for a wide variety of items during shipping, storage and transportation. Many case companies manufacture ATA “style” cases which, although modeled after ATA guidelines, do not conform to them and are consequently considered not as safe as ATA certified cases. Because ATA cases carry such a broad range of technical equipment of different weights, sizes and accessibility requirements, most ATA case manufacturers offer custom manufacturing while remaining within the ATA specifications. In addition to varying case designs, accessories may also be added to further enhance the product. Possibilities include telescoping handles, swivel casters, socket casters, edge casters, quick release casters, keylock latches, padlock latches and, for some models, legs that fold out to make the case into a table. 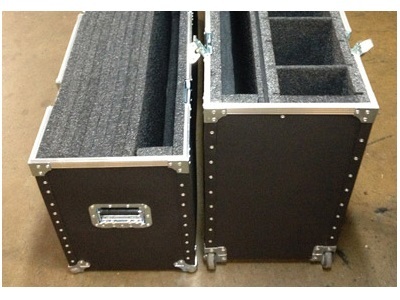 Businesses, manufacturers, entrepreneurs and artists use ATA cases for the transportation of high value instruments and equipment, including CPUs, motor lifts, TV monitors, digital sensors, sound mixing equipment and a broad range of electronic equipment. ATA cases have the same general structure because of the regulations they must meet from the material to the specific kind of rivets being used. Authentic ATA cases have strict rules regarding the materials used. They must be constructed of a certain plastic laminate, fiberglass or aluminum. The inner walls and partitions must be made of multi-layer plywood and should be fastened with an aluminum angle abutment bonded with steel rivets. Any exposed wooden edges need to be covered with an aluminum cap. Extruded aluminum fittings must be pneumatically driven every three inches along the outer surface of the case. Precautions have been taken to ensure that the aluminum does not accidentally snag while the case is in transit. All eight corners of the case must have steel knuckled ball corners that are accommodating for the stacking of similarly sized cases on top. Piano type hinging is required for ATA cases with a hinged lid. Other requirements are concerned with the latches, handles and interior lining. For example, latches may either be spring loaded twist latches or valance-spanning spring loaded draw latches. Rubber gripped recessed steel handles are to be used and attached by steel rivets. Also, the interior lining must be an esterfoam, a flexible polyurethane foam or ethafoam which is expanded polyethylene plastic. ATA Cases ATA cases adhere to a generalized set of dunnage specifications laid out by the Air Transport Association. 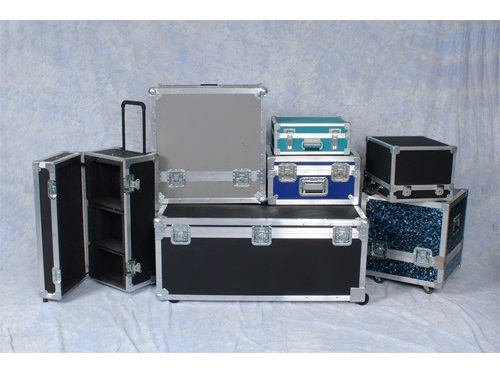 Although ATA cases are not used solely in air transport applications, ATA case manufacturing guidelines ensure that ATA cases are capable of withstanding high-impact transit for the transportation of delicate equipment and are particularly useful in safeguarding fragile items such as medical instruments, computer components and digital hardware.